Controla Tu Gobierno from Mexico is winner of the SWISS WATER INTEGRITY AWARD 2017! The Swiss Water Partnership has the pleasure to announce that the Mexican organisation Controla Tu Gobierno has been awarded with the SWISS WATER INTEGRITY AWARD 2017. The organisation has developed a social accountability model that focuses on building capacities in the communities they work with, based on the analysis of public sector information and to develop a process that goes beyond ex-post accountability, and strives to involve citizens in the performance of policies currently in force. supported the inhabitants of the river basins of Mexico City to identify what kind of public sector information they require to facilitate their participation in the management of water resources. increased the level of expertise of peasants, small producers and locals for auditing the performance of institutions and holding them accountable. created ‘communities of the concerned’ around social problems that increases the overall sustainability by building the identity of the participants as a group. 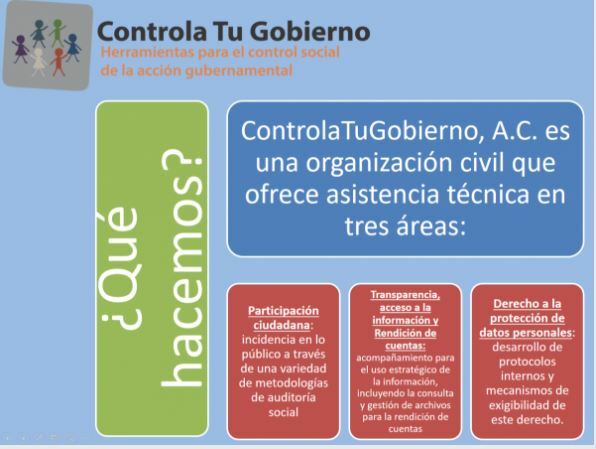 Wish to find out more about Controla Tu Gobierno or stay tuned for their success story? Check out their WEBSITE.